Looking for a new addition to your family? Adopt one of our retired athletes! Contrary to what most might think of working dogs and their conversion into house dogs, retired sled dogs make AMAZING pets. They're sweet & gentle with an unyielding desire to please. If you've had the pleasure of meeting an alaskan husky, then you already know how much they adore human affection. However our dogs are our family, so not all dogs whom retire make it to this adoption page, they get first dibs on our couch. And likewise, the one's that we put up for adoption, won't get rehired until we know for sure that we have found the the perfect home for the particular unique individual. Every dog that is born here has a place with us indefinitely, until the right home is found for them. If that right family never comes along, then the more spoiled old souls for us! Win, win. When Do Sled Dogs Retire? A common question we get from people is, "How do you know when a sled dog is ready to hang up their harness and retire?" The answer to this is easy, they tell us! There are two things in the working dog world that are known facts: ONE, pulling comes naturally to a sled dog, it's not something that we can teach. TWO, you can't make a sled dog pull. To put this concept into perspective, imagine taking your house dog for a walk--What happens if "Frodo" doesn't want to go for a walk? He runs, he hides, he sits down. You don't want to be that person dragging your dog down the street and we don't want to be that musher dragging their dog down the trail (wouldn't win too many races with us at lead). There's no trick in the musher's handbook to make a dog go. It's a very simple concept: If it's not fun for the dogs, it's not fun for us! So when our sled dogs stop jumping up and down screaming pick me when we have a harness in hand (just like Frodo does when you grab a leash); when they no longer live to pull, then it's their time to retire. Whether their 2, 5 or 12, every sled dog gets the option to retire. There are numerous reasons why our athletes might go into retirement. One might be that they've simply reached the average retirement age of 10. Some sled dogs are so devoted to their job we have to FORCE then into retirement at an old age of 14. Some retire as young as two because being a sled dog was never really their dream but dreamt instead of going to Hollywood to be the next Rin Tin Tin or Lassie (insert our kennel mascot, Maddie, here). Whatever their story might be, each Smokin' Ace is given the freedom to retire at will. If you're interested about learning more about adopting a retired sled dog, please contact us by email. Please only serious inquiries--Our dogs are our family and we want to ensure they find the home that's right for them. In our eyes, every dog deserves the Golden Couch Award at the end of their hard working careers, however long that may be. They've earned it! Egret came to Smokin' Ace Kennels as a yearling back in 2015. She was and still is a very special quirky girl. 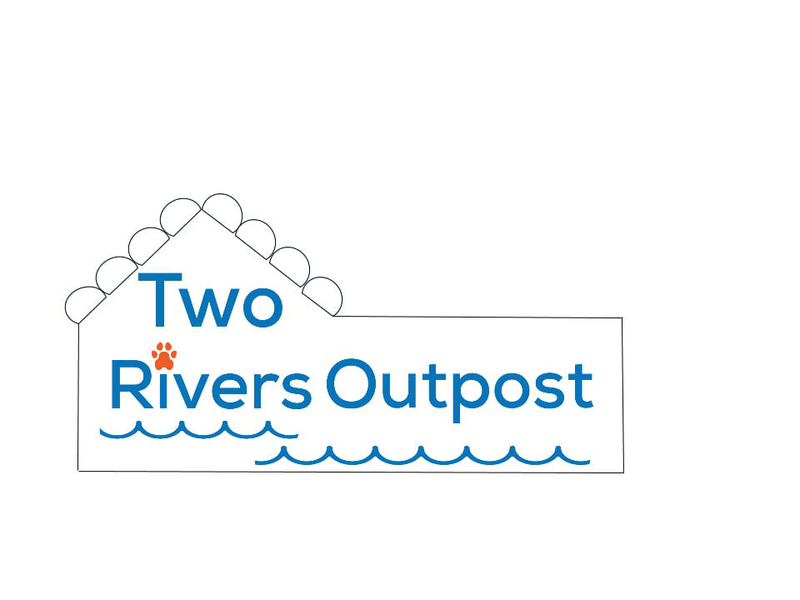 Egret raced the Two Rivers 200 with the puppies in 2016 and did a wonderful job, but once it was time to graduate into the A-team Matt was worried about her quirks. Over the years of working one-on-one with this little sweet heart, we were able to subdue her anxieties of being harnessed, but she never really warmed up to being handled. Don't get us wrong, Egret LOVES to pull, she's just a shy girl and we think this is a genetic inheritance. We loved Egret and didn't intend on rehoming her because we had invested so much time into making her feel comfortable and safe at our kennel and who else was going to do that? Then along came Mari! Mari is a friend and fellow musher from Two Rivers who is the type of musher who loves the ZANY sled dog. She's patient, funny and most importantly, Mari is compassionate. We thought what better place for Egret than at a small kennel where eccentricities are encouraged?! We should also note that ATAO is run by women with an all female sled dog crew. That's pretty pawesome. To learn more about Egret's new home, click the link below! Ringo is one of the Original 8 members and holds a special place in our hearts. Ringo spent the first few years of his life running the trapline with Matt in Eagle and entered Matt's very first race with him in 2013, the Top of the World 300. Ringo made it apparent that he want to retire from the race team in 2015, so he started his new short career as a puppy trainer running short miles with the newbies. We don't actively pursue rehoming our dogs, but when the right person comes along, you do what's best for the dog whether or not the dog is truly ready to retire completely. We met Hector Gutierrez on the race trail of the Copper Basin 300 in 2016. Hector had just recently lost his Siberian husky to old age and was looking for another dog to fill his doggy void. Through mutual friends we were connected with each other and for Hector and Ringo--It was love at first sight. Now the two live in Colorado and Ringo enjoys the luxuries of being the single spoiled child. The two are inseparable and go everywhere together! We know we found the perfect home for Ringo. Tank is one of our retirees that retired at the young age of 2. He never really wanted to be a race dog, but really loved running short distances. 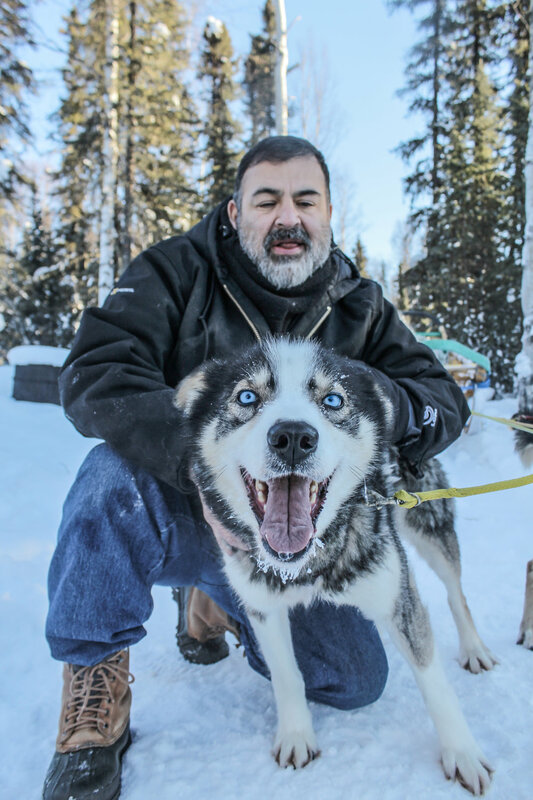 In 2015 we were contacted by Ken Severin to participate in the Mush for Kids event held every spring in Fairbanks. The event was cancelled that year because of low snow, but Ken still visited the kennel looking for a young male who might be willing to lead his small recreational team. We had the perfect dog for him! Since then Tank his filled the role has lead dog at their kennel, comes inside at night and gets spoiled with biscuits everyday. We see him every year at the Mush for Kids and he is soaking up the lime light! If you'd like to learn more about Mush for Kids & the Alaska's Children Trust, click the link below! We hope to see you there this year! Trucker has a similar story as Tank, which is fitting because they are brothers! Trucker decided at a young age that he too did not want to be a race dog, but preferred more so to just goof around outside! Along came the Carr's in 2016 who were looking for a family dog that might be interested in skijoring on family outings. We thought Trucker would be the perfect match because of his sweet and calm demeanor. Years later, Trucker and his new family enjoy winter hikes, while he runs loose alongside of them. He decided that he didn't care so much for skijoring, but the Carr's don't seem to mind!